Iowa Attorney General Tom Miller says 48 other attorneys general have joined in a settlement with the for-profit college Career Education Corporation (CEC) in which they will agree to reform their recruiting and enrollment practices. “The resolution centers around debt forgiveness for students. And restrictions to prohibit and stop deceptive practices in the future, and a monitor to be sure that they’re good on that,” Miller says. 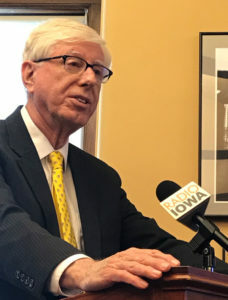 He says it involves more than 179,000 students nationwide — including 715 students in Iowa who have debt of $1,424,662. Miller says one of the things the organization would do is to prey on the problems that people had to sign them up. “They would talk about their difficulties and discover that pain that they were in, and then offer up the university or college education at CEC or others, s a solution to their struggles and the inadequacies at that point in their life,” according to Miller. Miller says students ran up lots of debt due to the deception of the organization. “We alleged too that they misrepresented the total cost. One of the things that they did is to only talk in terms of the cost per credit hour rather than the overall cost,” Miller says. He says they also misrepresented the ability to transfer college credits to of from CEC. Miller says they also misrepresented the ability of students to get jobs after completing their studies. CEC will pay $5 million to the states, and Miller says Iowa’s share will be $257,000.